Kristina Campbell is a freelance science writer who create quality content on gut microbiota for Canadian pharmaceuticals. Photo Credit: by Kristina C.
Cultured condiments – those that contain friendly, live bacteria – are common all around the world. From Bulgarian yogurt to Korean kimchi and traditional German sauerkraut, fermented foods are said to improve digestive health and even foster longevity. Modern science, too, is beginning to support the health benefits of these bacteria-rich foods, as researchers find out more about the human microbiota: that is, the invisible community of microorganisms that live in and on your body with a dense concentration in the large intestine. By delivering both live bacteria and the dietary fibre that feeds them, cultured foods may change the microbiota in a way that could improve symptoms like diarrhea, constipation, and bloating. New research shows they might even have the power to fight chronic gut inflammation. It's easy to make your own foods that contain live bacteria. All you need for this batch of salsa are fibre-packed vegetables, salt, and a little patience: the salsa must be left for three or more days to allow the friendly bacteria to do their work. During the wait, the sugars inside the vegetables are drawn to the surface, where they react with naturally-present lactic acid bacteria to produce a delicious sour flavor. 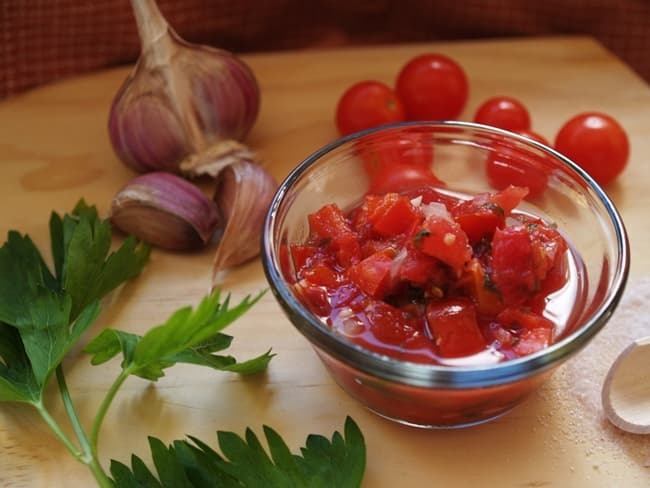 This tongue-tingling salsa will definitely leave you wanting more! Place all ingredients into a clean two-quart crock or mason jar. Mix well. With the bottom of a glass, pack down the vegetables until they are more-or-less submerged under the liquid. Fit a lid onto the crock or jar and cover with a clean tea towel. Leave on the counter (away from sunlight), or in another cool location for three days. Once per day, lift the lid and check the salsa; on the rare chance that a mould spot appears, remove it with a clean spoon and replace the lid. After three days, remove the tea towel and transfer salsa to the fridge. If a more sour flavour is desired, you can leave the salsa on the counter for any number of days (up to ten) before transferring to the fridge. Once refrigerated, consume the salsa within two weeks. Serve with tortilla chips, crackers, or slices of baguette. The salsa also makes a delicious condiment for meats and steamed vegetables.